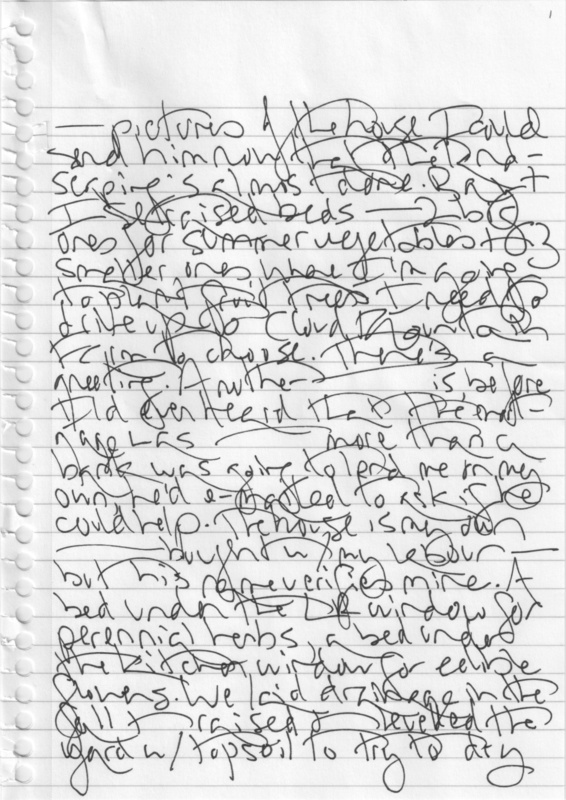 My base text is 24 of these handwritten pages. One for each hour of the day. Wandering off in time and space, thought and feeling, the text comes home time and again to my little Bellingham house, which my father, cosigning a loan, made me able to buy. The text becomes less verbal and more visual. Less legible and more beautiful. As one sort of meaning recedes, another sort steps forward, or I hope so. It’s me letting go, as he goes, of what my father was to me before. 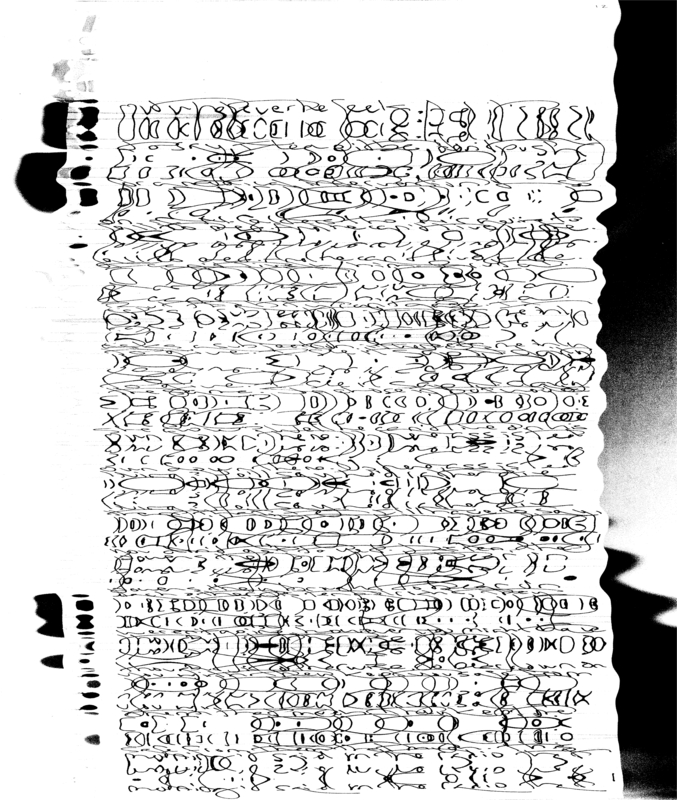 SCRO will have 2 lives, one as a physical scroll, ink on paper, and one ethereal in a gallery, as light and sound on the air. One, a scroll built of 24 aasemic panels like the one above, flown seamlessly together. Two summers ago, in a marathon session, one an hour over 24 hours, I made the images and cut and trimmed and affixed them to make a mockup. The wavy dark areas are my hands on the page, abstracted. … and all the way done (6am). The scroll, set for rolling. Scroll in a credible reading posture. 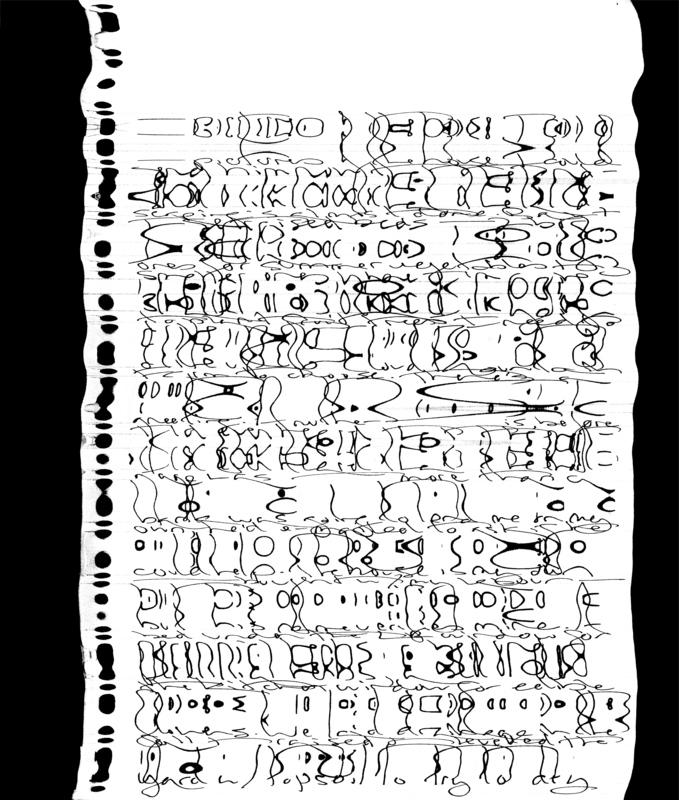 … only to make it mostly illegible? I picture the scroll published in a run of 100 or so. Each held close by one of those blue produce rubber bands, you know, for broccoli or asparagus. And why “SCRO”? Because scroll, truncated. Also escrow, same – the poem is rooted in my house, which my father made it possible for me to buy, by cosigning the loan. The one that eluded me for a few days was scrotum – in case I needed confirmation this is father-and-son terrain, brotherhood too, and what being a man means, in this day. The images are stills from the pages. And during my image-making marathon I was also harvesting ambient sounds: Skreeking gulls and jays. Freight trains going on mourningly. Megan Clint and Emerson their boy next door on the merits of hamburgers. Dogbark. Another neighbour’s AC unit. Distant traffic earblur. I make the poem in iMovie whose limitations I let be my formal constraints. Each video one minute long. Duration of each still decided by chance ops – some number of seconds that goes evenly into 60. (I go on a bit too long about that here). But these aren’t meant for YouTube. I mean them for casting in a physical space where persons in bodies can move in their bodies among. A large maybe labyrinthine space. Each of the 24 movies set separate. A big one here, a small one there. Each cast on its bit of wall, far enough from all others for its companion sound to attach to it. As you move round the space, the sounds admix, and you can feel the form you are occlude the images cast onto the I hope pocked and streaky white walls. Overall effect, a colloquy, democracy of light and sound, making no claims on you, but invitations to joy, plural and transient. 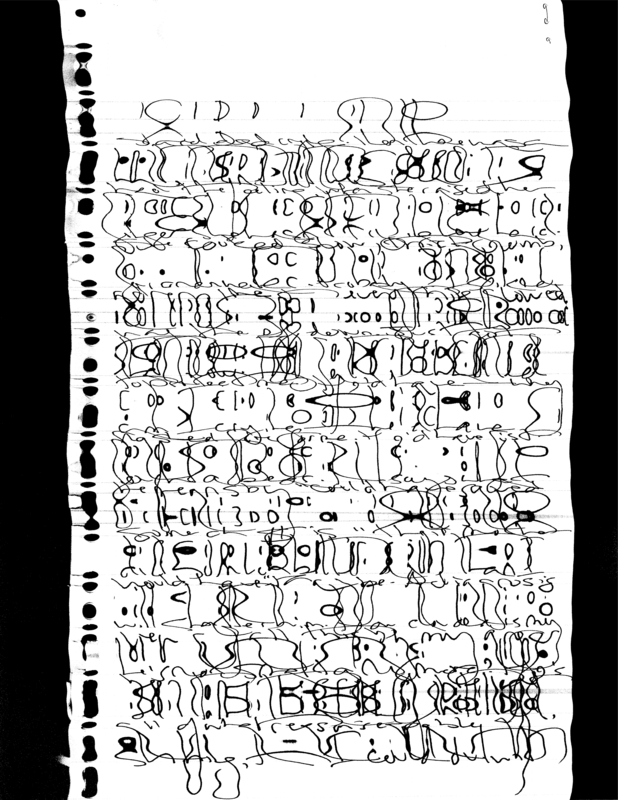 So far, videos from SCRO have shown at an exhibition of asemic writing at the Minnesota Center for Book Arts, and at a national juried drawing exhibition at the Whatcom Museum in my home town of Bellingham, WA. 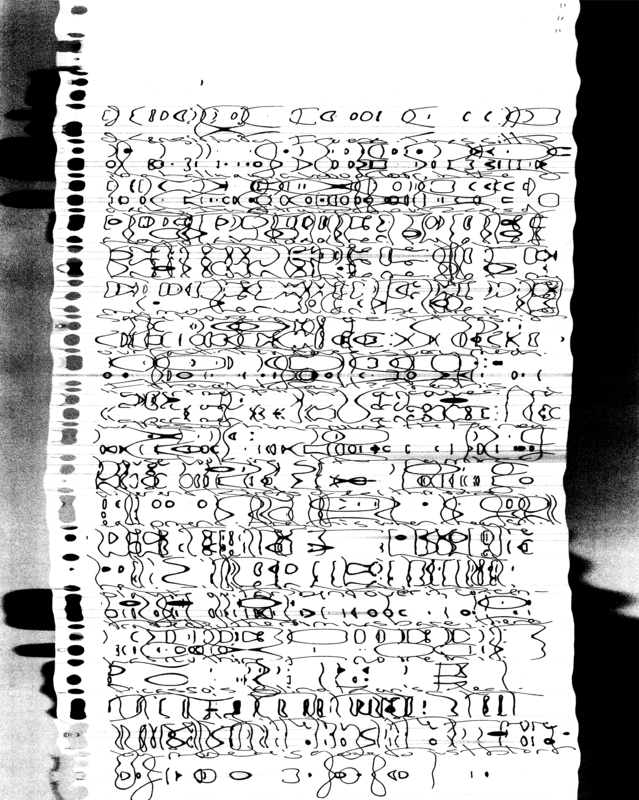 Is asemic writing a sort of ethnographic slapstick? How will this project contribute to your artistic development? Dear Canada Council, love, C.